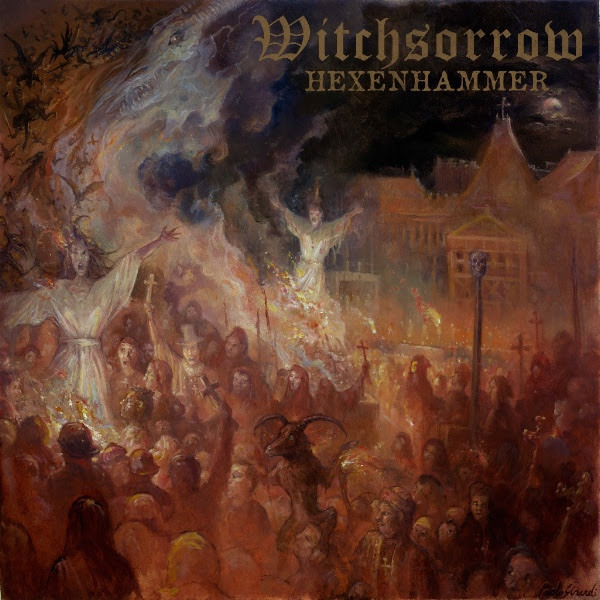 Hampshire doom metal maniacs Witchsorrow will release their fourth studio album, Hexenhammer on May 25 via Candlelight/Spinefarm Records. Listen to first single “Demons of the Mind” here. Written during a hermetic period following an intense run of live shows, and recorded at Skyhammer studio in Cheshire with longtime co-conspirator Chris Fielding (Conan, Primordial, Electric Wizard), and mastered at the legendary Orgone studios by Jaime “Gomez” Arellano (Ghost, Paradise Lost), the seven featured songs find Witchsorrow continuing to explore the darker corners of doom, illuminating them with the blinding light of sheer heavy metal forged of the strongest steel. It’s an almost anthemic soundtrack to the end of the world lyrics. If 2018 needs a soundtrack to its madness, Witchsorrow have provided it. Heavier, darker, doomier, and more metal than ever before, with a title relating to “Malleus Maleficarum” (“The Hammer of Witches”), a famous fifteenth century treatise, perfectly captured in the artwork by legendary Italian metal artist Paolo Girardi (Diocletian, Inquisition, Bell Witch), one of doom’s leading lights have made the perfect album for our times. Digital and physical pre-orders for Hexenhammer are now live here. “The Howling” by Drifter, boding well for the future!